All of this talk about different sizes, systems, benefits and features can make an air conditioner seem more complicated than it essentially is. Understanding how an air conditioner works can help shed light on why your system needs regular attention and how it actually goes about cooling your home. This is a story of your refrigerant’s journey though a series of coils that eventually end up removing the heat from the air in your home. Your lineset connects your outdoor air conditioning condenser to your indoor air handler, or furnace and coil. Liquid refrigerant moves into the home through the lineset and into the evaporator/indoor coil.. The liquid refrigerant goes through the evaporator coil while warm, indoor air is blown across this coil. Heat is transferred from the warm air stream into the refrigerant – resulting in cooler indoor air and the evaporation of the liquid refrigerant into a gas. The blower, located in your air handler or furnace, blows the cooled air through a series of ducts in your home.. The refrigerant gas returns to the outdoor air conditioning component where it is pressurized, by the compressor, and then pumped into the condenser coil. The condenser coil works similarly to the evaporator coil, but in reverse. Air is passed over the condenser coil, which results in warmer air that is blown out of the condenser/air conditioner and refrigerant that is changed from a gas to a liquid. The process is repeated until your home reaches the set temperature. Your air conditioner has a lot of components that are vital for maintaining cool temperatures and home comfort. This makes routine preventative maintenance an important part of owning an air conditioning unit. During preventative maintenance, your contractor can check the different parts and make sure that they are doing their part is this cyclical process. If one component malfunctions, the cycle is broken and your air conditioner can’t work properly, leaving you without cool air when temperatures are hot. Have you ever stopped and wondered how a furnace works? Like air conditioners, gas furnaces contain many parts that have to work together in order to provide the best home comfort. 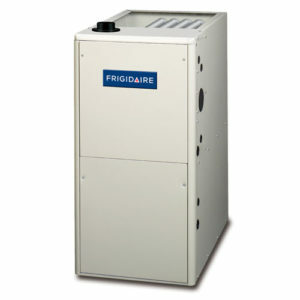 Ever been stuck without your gas furnace during a cold winter? Not fun. Here we detail just how a gas furnace works to provide warm air for your home. Keep in mind: The following is how a gas furnace works – not a packaged unit or an oil furnace. There are other heating methods besides a gas furnace that may be used in your home. When you raise the set temperature (in heating mode), the thermostat sends a signal to your gas furnace. 2. Keeping your family safe. When your gas furnace receives the demand for heat, the control board confirms that all of the safeties are in the correct position. Safeties are continually monitored throughout the heating process. The gas ignites in the furnace and then, after a 30-second delay, heating air is delivered throughout the duct system in your home after the furnace blower motor starts. 4. Safety measures during operation. If at any point the temperature limits or vent pressure switches are opened during the operation of the furnace, the gas is immediately shut off and a furnace shut-down sequence is initiated. Your furnace shuts down when it has satisfied the demand from the thermostat. While this explanation is bare bones, we want to reiterate that there are many safeties and fail-safes in place in your gas furnace that ensure that you and your family are as safe as possible while your home is heated. If something goes wrong, that can mean trouble. That’s why it is critical that you schedule yearly furnace preventative maintenance before heating season (in the fall) to catch any minor issues that could turn into major problems later. This is the big opportunity to save money. Although high-efficiency air conditioners cost more than standard-efficiency systems, they can make up the difference in utility bill savings each month. Not only that, but they can qualify for tax credits and incentives that will help lower the upfront cost. The cost to run an inefficient, old system can be taxing on the bank account. Even replacing your old air conditioner with one that meets minimum efficiency ratings can help. How Do You Operate a Heat Pump in Winter? A heat pump works by transferring heat from the outdoor air and distributing it throughout your home. Knowing that, you may be questioning just how this system is able to achieve its heating goals during the winter. When temperatures plummet, it may seem like there is not much heat available for extraction from the outdoor air. However, unless the temperature is at absolute zero, there is always heat to be extracted from outdoor air. The question is, at what temperature mark does it become less efficient to heat with your heat pump? It’s hard to pinpoint the exact temperature mark. However, a good benchmark is when defrost mode is activated – at around 32°F. This is when ice can start to form on some of the outdoor components of your heat pump. In defrost mode, your unit will stop heating for the amount of time it takes the components to reach an acceptable temperature. And, generally, this is when your backup heating kicks on, which can result in higher than desired utility bills if you don’t have a gas furnace. This is why, in areas that see frequent temperatures below freezing, it’s an excellent idea to pair your heat pump with a gas furnace. If your contractor hasn’t explained defrost mode, it can be alarming the first time it happens – the unit may become loud and cooler air may come out of your vents. Defrost mode happens when ice forms on outdoor components of your unit. When this happens, your heat pump actually goes into air conditioning mode (warm air is expelled through your outdoor unit and is able to thaw the components). So, it’s not cause for alarm – it’s actually normal. That is, as long as it isn’t happening too frequently or for long periods of time. Heat pumps will take longer to heat your home. It’s a process of heat transfer, NOT heat creation (which is actually why it can be more efficient to a certain point). So, if it feels like the air coming out of your vents isn’t warm enough, give it time. You should only use the emergency heat setting if your heat pump is not working correctly and you are waiting on a contractor. At all other times, it is best to use your heat pump’s regular heating mode or your gas furnace. Constantly running the emergency heat setting on your thermostat can actually result in higher electric bills. Like all systems, there are things that can happen with your heat pump when something isn’t right. Here are some instances when you should think about calling your local contractor. Your unit stays in defrost mode for hours. Your unit is consistently delivering cold air (when set in heating mode). Your heating bills are suspiciously high. There are certain things you should be doing throughout the winter, regardless of whether you have an air conditioner or a heat pump. Here are some things you should keep in mind. Do not use a cover if your heat pump is in operation. Although covers can be a good idea for air conditioners, to keep debris out, you never know if you are going to need your heat pump during the winter. Make sure you change your furnace filter to avoid blocked airflow. Since you aren’t using a cover, make sure that too much debris does not accumulate on or around your condenser. Like a dirty air filter, this can lead to blocked airflow and lower efficiency. Schedule maintenance twice-a-year to make sure that your heat pump is prepared for both hot and cold weather.